Our first priority its custumer satisfaction and more inportand we are licenced and insured. Hire a licensed and insured company you can trust capable to handle any electrical job don't mater how big or small the job is. we are comet to our costumers needs. we are located in Broward county and perform all Cain of permitted and non permitted required electrical work all over south Florida including Dade and Palm Beach. 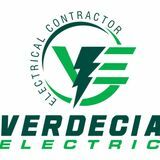 I am an Estate register Electrical Contractor with a great team of professionals electricians all of them speak both language Spanish and English.